Today was a beautiful day here. It was bright, sunny and warm with a pleasant breeze. This morning, I slept in late -- until almost 10:00 am, giving me about 13+ hours of sleep! While it sounds like a lot, it only helped make up for Thursday night's complete lack of sleep! Our little dog, Spike, who is a Bichon Frise, was up all night pacing, fidgeting and whimpering when touched with any pressure. I laid on the floor with him for over 3 hours Thursday night and was able to get him to sleep as long as I was petting him and soothing him. When my body couldn't take lying on hardwood floors any longer after 3+ hours, I tried making a spot where I could sit up with him on the floor -- "no can do". It was obvious that he would be going to the vet Friday. Meanwhile hubby and I did not get any sleep whatsoever Thursday night, but fortunately for hubby, he had the day off Friday -- I had to work and felt like a zombie all day long. I figured Spike had a tummy ache or something wrong with his back (he had back surgery 6 years ago). On Friday, our vet told us it was his back again...and as my eyes filled with tears -- he told us that thankfully, at this point, it doesn't appear to be serious like it was last time when he needed surgery. They gave him a pain shot, steroids and muscle relaxers and they will check on him again next week. Last night I actually fell asleep without any dinner from complete exhaustion and slept over 13 hours until this morning. You don't appreciate sleep until you don't get any...and then you get plenty -- the difference is amazing! So, tonight, I was ready for dinner! 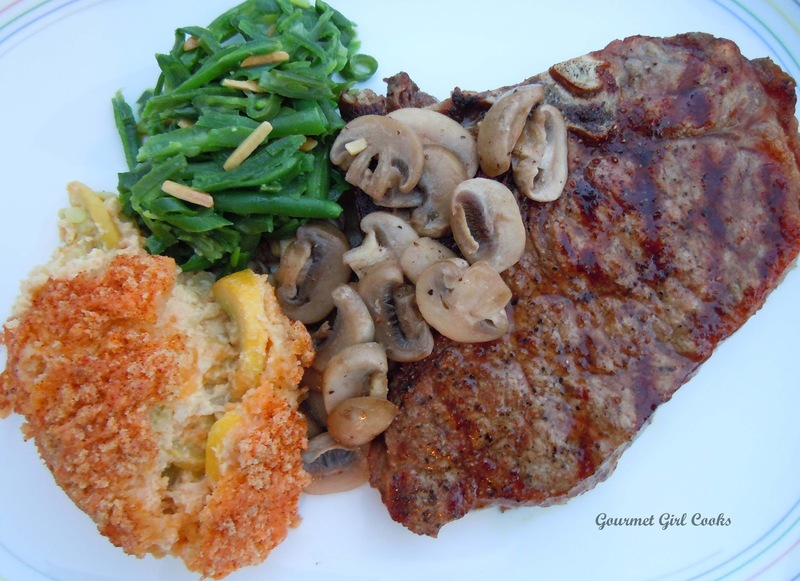 We picked up a couple of porterhouse steaks and grilled them. 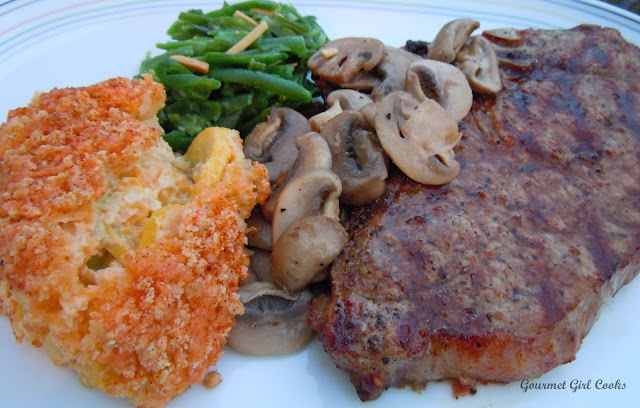 I sauteed some sliced fresh mushrooms for my steak and made my Yellow Cheddar Squash Casserole and green beans with almonds to go with our steaks. Hubby had a baked potato with his. The meal turned out great and I have enough of my steak and sides leftover for my lunch tomorrow, too. 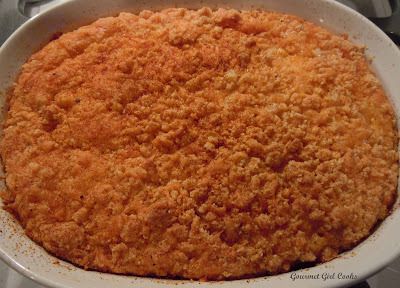 When I made my squash casserole, I added extra cheese to the topping as well as a little more cayenne, salt and black pepper to give it a little more kick. It turned out delicious. The recipe for my squash casserole is embedded in the link above. Enjoy! Best wishes to Spike! Get well soon; casserole looks extra yummy! Thanks for posting! Hope your darling little dog is feeling much better ... and hope you are too! Hi again Cybersis! Thanks so much -- I do think he is getting better. He isn't acting like he is in pain and he can wag his tail again which he couldn't do (or wouldn't because of the pain). I think I have finally caught up on my sleep. Thanks for the kind words.